Appreciative Inquiry is on a short-list of prime influences for my management, relationship, facilitation, change management, and organization behavior work. I have written blogs on Appreciative Inquiry a lot, but I find the constant default to deficit-based diagnostics and problem-solving relationships leaves me in need to recharge. 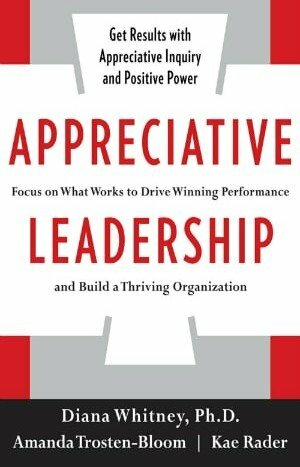 The preference to look where things are correct, magnify people modeling what works, and shine a light where interactions model possibility is where I prefer the focus and this book lends the model to appreciative leadership. I’ve read Diana Whitney repeatedly and this book was a logical addition. Business assets appreciate when leaders appreciate. This is a route to sustainable results. Leadership is not a title given, leadership is a competency observed by others. Leadership comes from all levels.